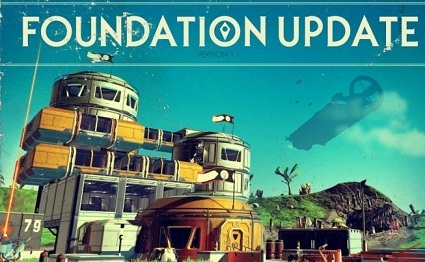 With the new Foundations Update 1.1 to the No Man's Sky you can build your own base and settle on a planet of your choice. In doing so, you grow different plants and recruit an alien to carry out new research. Your own base is only the beginning for No Man's Sky. According to the developer, the update 1.1 is just one of many more, which should bring more gameplay features into the adventure. However, each of the many changes should be free of charge. Part of the update lets you select one of three modes: Normal, Survival, and Creative. If you want to try first in the basic building, you should choose the latter. A separate game is created for each mode. In order to build, you need of course enough resources. With the update not only the icons change but also you can recognize the resources better. The display has also improved, so you can quickly identify the materials you need. If you have collected too many items, you can store them in your new freighter. It hovers over your home planet and is waiting to be expanded and filled. - Fly as usual through the universe and discover planets. If you have found a nice one you want to feel at home, you have to unlock the signal scanner first. The resources for this are easily found on every planet. - Now place the scanner and let it search for habitable outposts. - Now you have to follow the signal and go to the small base. - Enter and go left to the Base Calculator. - Here you can get an overview of all the terminals you can build. This includes engineering, science, agriculture and forestry. - In order to be able to build at all, you need a construction terminal. But before it goes into operation, you have to recruit an employee. - The construction module must be built in a separate room. Open the building console and look for the structures to build a space. If you lack resources for this, you have to look for them. - Once the module is built, grab your spaceship and travel to a space station in space. Here you will find two rooms. In one of them there are several extras that you can recruit as soon as you click on them. If you have found a new employee, you must return to your own station. - Talk to your employee here and follow the steps to further develop your own base. The structures usually cost iron. If you want to quickly move between your base and a space station, you must warp three times. If you build a different base on another planet, you will get some of the materials from your first station back. As soon as your terminals are placed, your former employees will appear again.